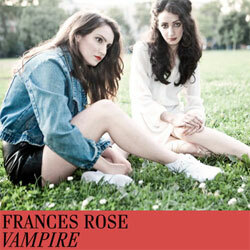 If aliens were into goth music, they might listen to Frances Rose. They're writing the soundtrack to some landscape, but its contours are all their own. Maybe that's why pioneer Lizzy Plapinger (MS MR) has taken the electro-pop sisters Sarah and Michelle Rose under her label's wing. Or why they've recently worked with VICE's campaign for Garnier Fructis, and won Deli's Magazine's readers poll for best new emerging artist. Whatever the case, you're not likely to find anything quite like their electronic, psych vamps if you try. Take a listen... and find your inner vampire. Tell me what it's been like the past year!? You two have been through some enormous changes in a very short period of time. Sarah: This year has been really exciting for Frances Rose, between the VICE campaign for Garnier Fructis, winning the Deli Magazine reader's poll for best new emerging artist, shooting photos with Shervin Lainez and Ben Ritter, releasing 'Vampire' on the KITSUNE AMERICA compilation alongside artists such as Gigamesh, SELEBRITIES, Hearts Revolution, Childish Gambino, and writing and recording our first record, yeah...2013 has been pretty awesome. When I listen to you guys, I feel like I'm hearing a pop anthem and an intimate acoustic vamp at the same time. Do you two write your material over beats off the bat, or does the process begin with other instruments? Sarah: The process begins with an acoustic guitar or a grand piano. We write a lot at the Gibson Showroom. They have an insane white Baldwin grand piano...We write a lot at the kitchen table. We like to write and lay down the beat together. Michelle: We write all the material stripped down with an acoustic guitar or piano..then add electronic production & beats in the studio collaboratively with our producers. You seem to have made a fan of MS MR, are you guys fans of Lizzy as well? Sarah: LIZZY, Ms. Neon Gold, is both a friend and an inspiration. It has been a truly incredible experience watching MS MR develop. Their style is seriously noteworthy, and I really love how they play with color, especially the teal and pink in 'Hurricane', SO FIERCE and future. Michelle: All hail to Ms Gold of the USA! Me and my brother seriously argue over everything (even though I'm obviously right). What's the secret to working so well with your sibling? Michelle: I work well with Sarah I don't have to hold anything back.. opinions.. criticisms.. critiques.. tears..
What new music is on the horizon for you folks? I need MORE! Michelle: We've been hiding away for quite a while recording an EP with some dynamite producers. We can't wait to share it with the world! 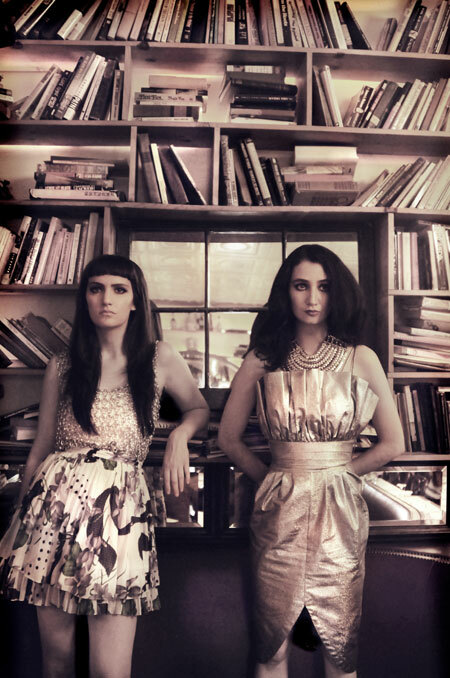 Sarah: We experiment with analog synths, ambient vocals and sci-fi lyric imagery. It's like a french nouveau goth dream. We like to call it, the space farm.
" It's like a french nouveau goth dream. We like to call it, 'the space farm' "